Since the beginning of my ministry as a pastor I have been committed to preaching the Bible expositionally. The main way that I do that is by working through books in the Bible verse-by-verse. Recently, in my exposition of Exodus, I have come to chapter 20, which contains the Ten Commandments. These “ten words” are of crucial importance not only for understanding God’s ways with His Old Covenant people but also for understanding His ways with us today. These ten laws are unique among all the commandments that God gave to the Israelites. When interpreting the Ten Commandments one important consideration to keep in mind is that these laws did not originate with Moses. He did not come up with them on his own. Neither did they come into existence at Mt. Sinai. Rather, God published them there in dramatic fashion. But, as Genesis 1-Exodus 19 make clear, these commandments were in force prior to their being dramatically codified in tables of stone. Consider the following Scriptural evidence. —Genesis 35:2, God rebuked Jacob because he had not put away the “foreign gods” that were among his family. —Exodus 16, God revealed the Sabbath principle in the regulations for collecting manna. He rebuked those who violated it: “It came about on the seventh day that some of the people went out to gather, but they found none. 28 Then the Lord said to Moses, “How long do you refuse to keep My commandments and My instructions? 29 “See, the Lord has given you the sabbath; therefore He gives you bread for two days on the sixth day. Remain every man in his place; let no man go out of his place on the seventh day” (16:27-29). —Genesis 9:18-27, God cursed Noah’s son, Ham, for dishonoring his father by looking on his nakedness. —Genesis 4:8-16, Cain murdered his brother Abel, and was punished by God for it. —Genesis 19:24-25, God destroyed Sodom and Gomorrah for their sexual immorality (cf. Jude 7). —Genesis 31:19-32, “Rachel stole her father’s household gods” (idols) and Jacob rightly condemned the crime as being worthy of death, not knowing it was his own wife who was guilty of it (v. 32). What does all of this mean? It means that the 10 Commandments did not originate with Moses or at Mt. Sinai. Rather, God verbalized them there and wrote them on tables of stone with his finger on that occasion to formalize and clearly stipulate what He has always required of all people everywhere. These Ten Words are a summary of God’s will for His image-bearers everywhere. 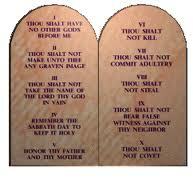 In a future post, I will discuss the place of the Ten Commandments in the New Testament. 1 A. W. Pink, The Ten Commandments (Swengel, PA: Reiner, 1961), p. 5.